Is this possible to do with shaders? OpenArena Message Boards > OpenArena Contributions > Graphics > Is this possible to do with shaders? 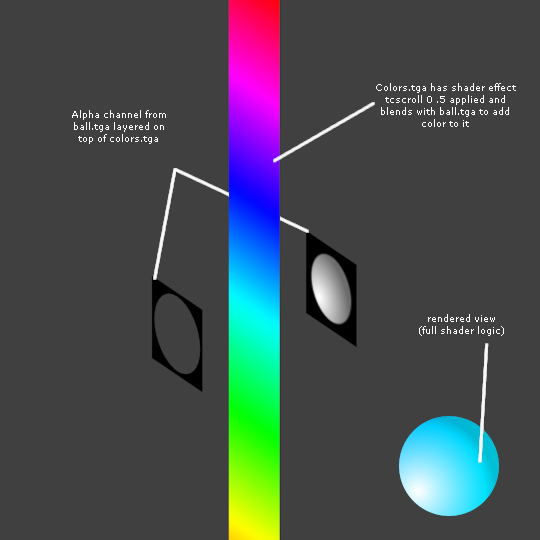 I'm trying to figure out ways to shift colors with shaders, it seems they only let you mess with brightness as far as I can tell in the shader manual. I thought up another possible way to do it, but I can't figure out if it's possible. It's kind of tough to explain my logic so i've rendered out a 3D view of how I'm trying to construct the shader in blender and broke down the components. basically I want to borrow the alpha channel from the image the color data image is layered over, but still let the color-wheel image scroll without taking the alpha channel with it. I'm guessing the answer is "no you can't do this" but I figured i'd ask just in case. Re: Is this possible to do with shaders? Untested unformatted psuedo code follows!! !